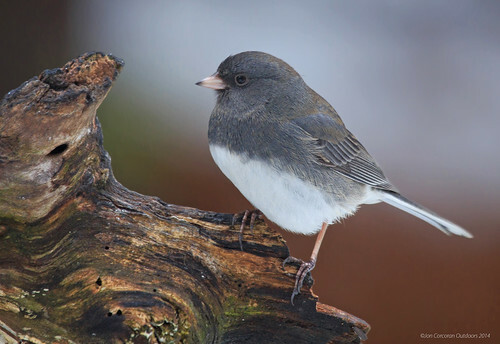 There are 12 subspecies of Dark-eyed Junco (Junco hyemalis) and they are divided into five subspecies groups with identifiable differences. A Dark-eyed Junco with leucism condition. This is first time I've seen such a bird and to find it in my viewfinder. 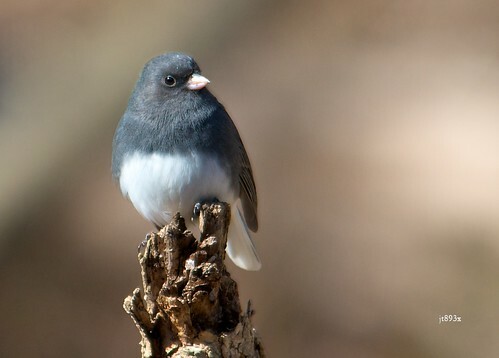 Learn about the Dark eyed Junco! Special thanks to Dennis Mortemore for help in filming and editing! 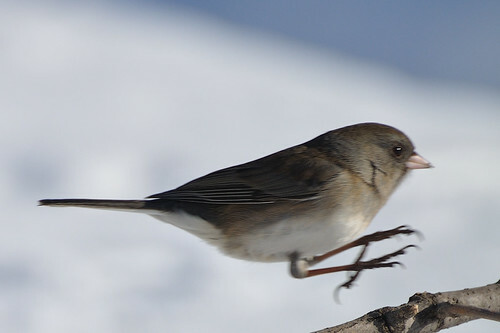 One of thousands and thousands of juncos that are migrating through our region this week en route to high-latitude boreal Breeding grounds in central and northern Manitoba. Photographed at Fisher, Minnesota (10 April 2010). 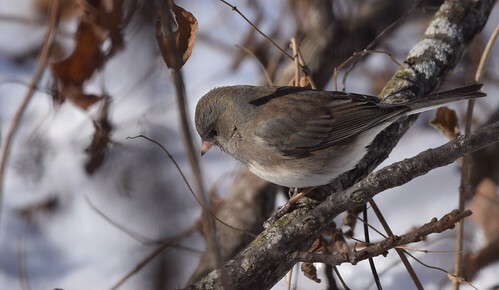 According to my Ontario Birds book, Juncos are common winter visitors in southern Ontario, and can be seen at backyard feeders like mine! Because these two were slate and white, I think they would be males; females appear to be more brown (based on my google search). My bird book is "Compact Guide to Ontario Birds" 2005 by Lone Pine Publishing. Dark-eyed Junco (Junco hyemalis), a.k.a. Snowbird, Wildlife Garden, Gagnon Wildlife Habitat, Pottersville, Somerset, Massachusetts, Friday morning, March 22, 2013, 7:29 AM - Canon PowerShot SX260 HS MVI_28544; 2:53 min. Want to witness evolution in action? Learn more about these abundant North American birds. An excerpt from Ordinary Extraordinary Junco.